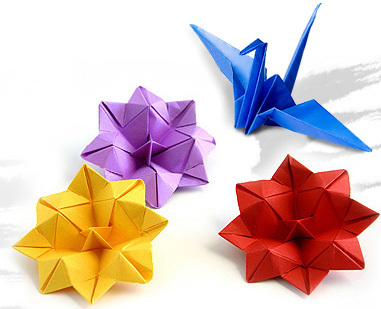 The word “origami” is formed of the verb 折る (oru), in an infinitive form, and 紙 (kami), turned to “gami” as the second part of a compound word. I maintain that such pronunciation changes exist simply to make it easier to say, i.e. less of a tongue-twister. Thus, origami quite literally reads like folding paper. As in, the act of folding paper, not paper for folding in and if itself. To state the obvious, it’s hard to have the folding of paper without paper. The Asian history of paper goes back quite far, but according to various sources, what we now call origami (but which was known by a variety of other words) was a Japanese folk art in the 17th century. This would place it in the era of peace and unification that followed the Sengoku Jidai. In other words, it is likely only during the relative economic prosperity that marked this period (but which later stagnated) that the common person gained access to paper. We know that it was during this period that literacy and writing became a popular affair (i.e. that spread through the general population). Stories of paper art go back much further, but these were upper class affairs. The famous mystic Abe no Seimei was said to have transformed a paper bird into a real one. Paper was used for religious ceremonies following its introduction in Japan by a Buddhist monk in the 6th century; of course, the high cost of paper largely confined its use to religious ceremony. Centuries later, paper was being used for formal wedding celebrations. Japan was not always a wealthy country. Many things which are now considered priceless pieces of culture were considered… pathetic pieces of inferior, non-Chinese culture in times long past. In addition, Japan did not have much gold historically. This inspired much of Japan’s cultural search for value in simpler things. If it had seemingly limitless wealth, like the center of the Chinese Empire, this likely would not have been felt necessary. As a result, paper art became a prized gift exchanged between samurai. Paper was still exclusive enough, and art itself valued highly enough, and samurai not inherently wealthy enough, that this was a thoughtful and appropriate gift. If it is the thought that counts, the thought was one greatly appreciated, since the key feature in origami is not so much the results, which while intricate, are by necessity limited by what you can do with paper; the value is in the time you put into it. Folding paper as something to occupy children with was actually a key feature of the Kindergarten Movement, led by Friedrich Fröbel. Like in Japan, the folding of paper was a folk art in Germany (as well as Spain and China). It is from he that we have the use of colored paper for origami today. It’s not really that complicated. His view was that the colors helped children focus on the matter, but that the folding of paper, in and of itself, helped young children develop mentally and in terms of eye-hand development too. Josef Albers, the father of modern color theory and minimalistic art, taught origami and paper folding in the 1920s and 30s at the famous Bahaus design school. His methods, which involved sheets of round paper that were folded into spirals and curved shapes, have influenced modern origami artists like Kunihiko Kasahara. So in other words, what we call origami isn’t purely Japanese at all; it’s just that, as a worldwide phenomenon, it incorporates Japanese ideas in addition to German ones. In Japan, the 鶴 (つる, tsuru, crane) is an auspicious bird (i.e. it brings good fortune). Certainly the crane is a beautiful and serene bird. Thanks to this, the crane is a core feature of origami in Japanese folk art (older and modern). So, this is certainly one aspect of Japanese culture that has influenced the development of what we call origami. So, origami is both Japanese and something that is international culture. (After all, we’ve all heard of paper tigers, right? That’s Chinese.) It can be simple and intricate, or far more elaborate if people choose. Art is, ultimately, a human endeavor; it is our choices that make it what it is. This entry was posted in Culture, Japan, Origami and tagged culture, folk art, Japan, origami, tradition. Bookmark the permalink. Origami Kit For Dummies gives you all the material you need to get started in origami. Download Your Free Copy of World Famous Origami e-book! it’s really Free!!! Where can I get instructions for that flower?